There's so many things we've grown accustomed to over the years, that we forget we didn't have them back in the 1970's. It's easy to remember a time before cell phones, personal computers, cordless remotes, TiVo and microwaves... but we forget such simple things as the snooze button. The snooze button is a curse to procrastinators like myself. I typically will press snooze as many times as I can get away with - to the point where I box myself into a corner and have to rush at Mach 3 to get out the door. Early bird Gilligan is not. After the remote control, the snooze button is the next greatest invention ever. Those nine minutes are the best sleep of the night. What if I don't want 5 or 10 minutes extra? What if I want 4 or 9 minutes? What's a girl to do? Am I out of luck? Stupid 70's alarm clock WANTS me to be late. I've actually never used a snooze button for some reason. I usually wake up before the alarm even goes off. I run my own business out of my home, so I haven't needed an alarm clock for years. I sleep as late as I want, whenever I want. In fact, I may give myself monday off as well, and maybe a half-day on friday. Life is good. In Chna they do not have snooze control clocks. As well 99% of clocks sold are all analog, no LCD number types, and the same amount runs on batteries since electricity here cuts on and off all the time. As well, it is safe to say that 60-70% of clocks sold here are designed for fruitackes in the shape of Winnie the Pooh, Minnie Mouse or Hello Kitty. 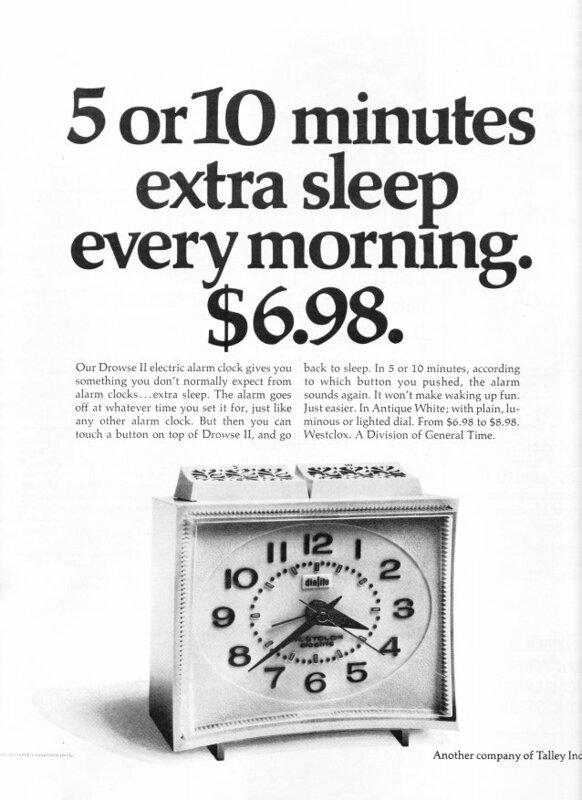 No snooze button in the 70's? My clock-radio had one. My parents gave it to me probably 1970, whereupon getting up in the morning was completely my own responsibility. Unfortunately there was also a kind of interesting radio show on late at night, after which one had to read a bit which made it even later...still never liked the snooze button much. Mr.Anon managed once to snooze button his way through the whole morning, from 8 to about 12; 4 hours of beep every 5 minutes. Oops, the ad even says 1970.